The first few September SOTM swaps are in! I know I haven't kept up with posting here at all like I had intended, but I'm ready to start over again and try to do better at keeping this blog up to date (AGAIN!) lol! So here's the latest, I'm hosting and participating in an artwork swap with a few of my local CTMH consultant team members and friends. 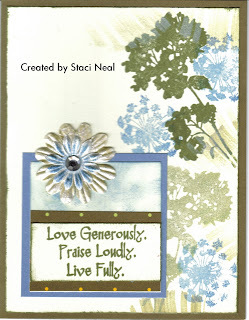 There are 8 of us participating and each month we will create 8 similar items each using the upcoming Stamp of the Month and a new coordinating My Reflections paper pack to swap with each other. 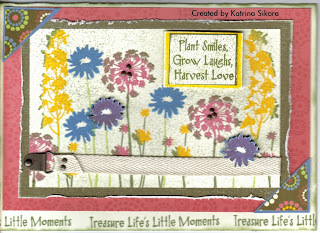 So for September we are using the Magic Moments papers and colors with the "Treasure Life" stamp set. The swaps are due this week, and these are the first three swaps that were dropped off to me today! I am so thrilled with the beauty and creativity of each one and couldn't wait to share them with you all here!! The beautiful details are much better looking in person and up close, as scanning them sometimes distorts the colors and true dimensions of them a bit. GREAT JOB on these ladies!!! I've posted these in the order I received them - 5x7 card by Katrina Sikora, 6x6 card by Nikki Kington, and a Standard size card by Staci Neal - these scans just don't do justice to the beauty of all of these cards. Staci used pearlescent paint tinted with hollyhock reinker to paint her flower and the edge of the paper around her stamped flowers. In real life they appear brighter pink and are nice and shimmery! I look forward to seeing the rest of the swaps that will be arriving later this week and will be sure to share them here as I receive them also!